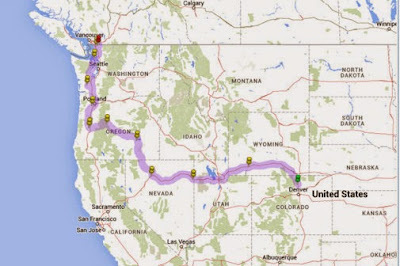 With our solar panels soaking up the sun’s rays, we left Eugene on May 2 and made our way towards Portland. We drove along OR-99W and passed field after field of newly planted crops. Everything was so fresh and green, and it was a beautiful route to travel. We wondered what was growing in the fields and were surprised to learn that the dark green plants were mint. I’d never seen that before. We also noticed several small fields that were solid white, and a few that were crimson, and guessed that these might be clover. Very pretty. We detoured west from Corvallis to the town of Philomath and the Gathering Together Farm, an organic farm that also features a very popular restaurant. Lunch was wonderful. After a stop for a few organizational supplies, we made our way to Tualatin, which is located just south of Portland, and the Roamers Rest RV Park. 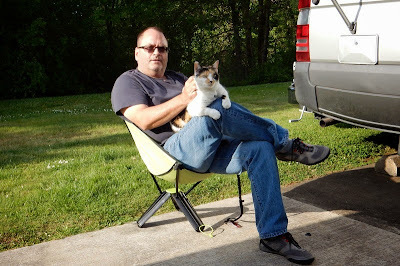 Here we lucked out with a site along the Tualatin River and promptly took out our new chairs to enjoy a glorious day. 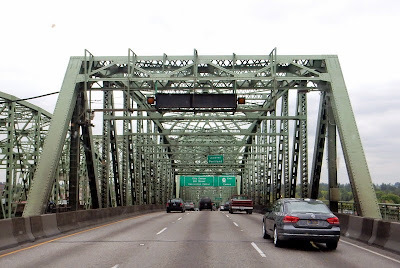 On Sunday, my friend Kevin picked us up and drove us to downtown Portland where we spent most of the day. We were able to see his new apartment, which was fabulous. 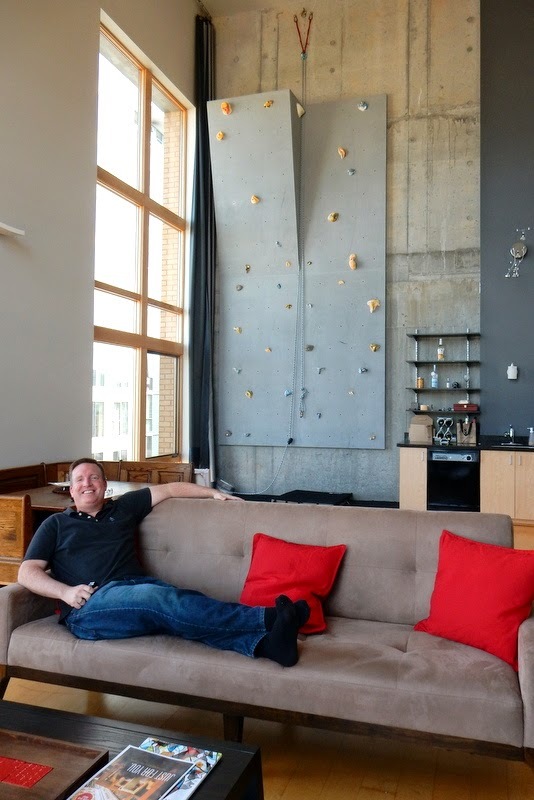 How many apartments have a two-story climbing wall? That was something to see! After a great lunch and a leisurely stroll around the downtown area, it was time for us to return to the RV. Although our visit with Kevin was brief, I’m so glad we were able to spend time together. 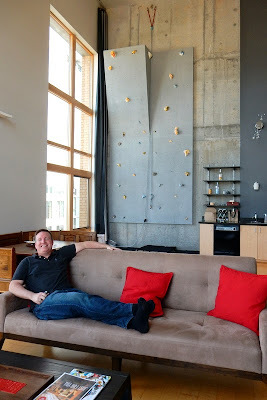 Do You Have a Climbing Wall in Your House? On Monday morning we had an appointment at the Sprinter Store at Upscale Automotive in Tualatin. Perhaps I’m too cautious, but I wanted to make sure the RV was in great shape before driving in the wilds of Alaska. There aren’t too many places that service Sprinters in the far north. Tim indulged me, and I was relieved when the RV was pronounced in good health, with just a burned-out bulb on the back-up light. That was an easy fix. With our chores completed, it was time to have fun. 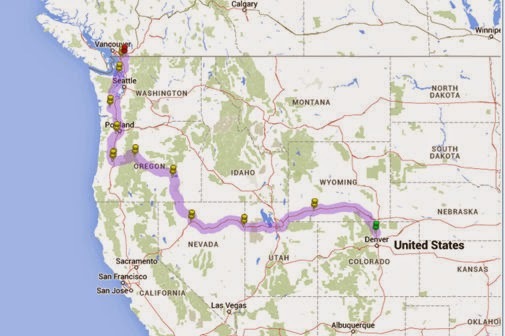 We pointed the RV north and crossed the mighty Columbia River into Washington State. On my agenda was a lunch stop at Burgerville, my favorite fast-food restaurant. 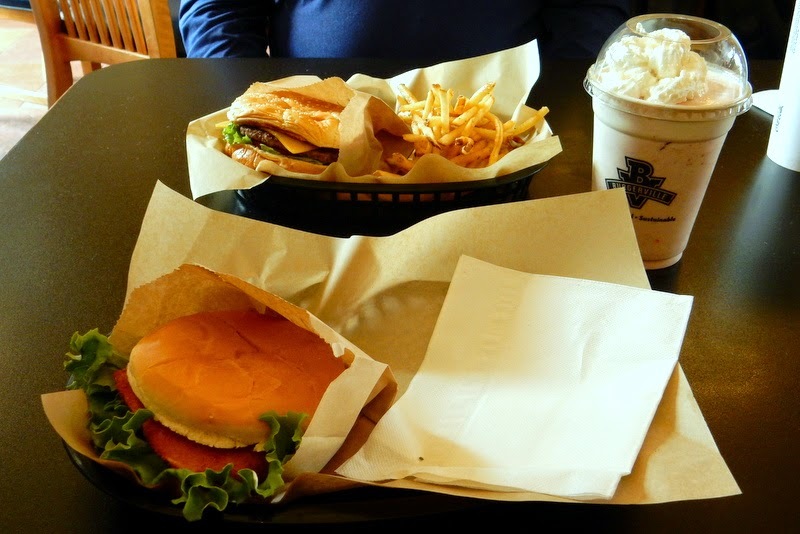 Located only in the Pacific Northwest, Burgerville is a small chain that features fresh, locally-sourced food. Many of the restaurants even list which farm produced which items. Seasonal specialties are also highlighted, and I was really looking forward to a fresh strawberry milkshake. We almost didn’t make it into the restaurant after I had a slight mishap in the parking lot. I had already exited the RV while Tim was still inside, and for some reason I decided to open the sliding door. As soon as I did, Tim yelled and Kitty ran outside. This is not something she does (she only goes outside on a leash), and I immediately panicked. We were parked next to a major road, and visions of “Pancake Kitty” crossed my mind. I lunged to catch her and managed to grab her tail. I was afraid to pull too hard so as not to hurt her, and instead hurt myself! I fell on the asphalt, and Kitty went the other way. Tim watched in disbelief as all of this unfolded, and being the wonderful husband that he is, rushed to me to see if I was ok. I wasn’t worried about myself – only the cat! I assured him that I was fine and yelled at him to get the cat. Luckily, Kitty had just headed to the nearby green area and was happily munching on the grass. Tim was able to calmly pick her up and redeposit her in the RV. I could have killed her, but I was so relieved that she was safe. I was ok as well, just a skinned and bruised knee. 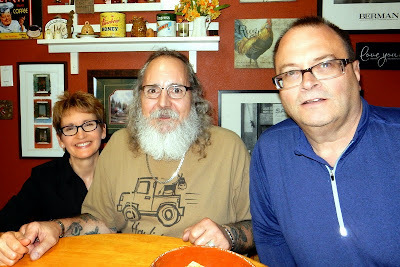 With that exciting episode behind us, we had lunch and then continued our drive to Chehalis, Washington, where we would driveway camp for the next two nights at the home of one of Tim’s closest high school friends. 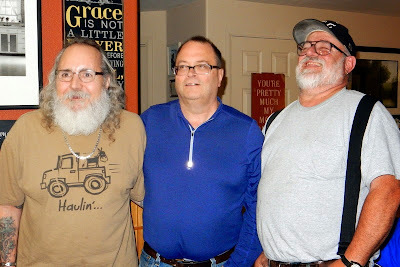 We had seen Howard and his wife Pam this past summer at Tim’s high school reunion, and they had invited us to stop by if we were in their area. It just so happened that their home was on our route to Alaska, so it worked out perfectly to spend a few days with them. Howard and Pam were so generous and prepared wonderful meals for us, which we much appreciated. It seemed as though Tim and Howard picked up where they left off the last time they were together. That’s the nice thing about old friends. I think I had just as much fun as they did, and I especially enjoyed talking with Pam. On Tuesday evening another high school buddy and his wife drove down from Seattle to join the fun. I had never met Tony and Juanita, but immediately felt I’d known them a long time. I can only begin to guess the trouble that those three guys got into in high school. I think it’s wonderful that Tim still keeps in touch with people that have known him since he was a kid. That’s a special thing in my book. It was soon time for us to leave and make our final push toward the Canadian border. We didn’t want to push too hard, however, and took the slow road along the Olympic peninsula instead of fighting the traffic through Seattle. The drive along the Hood Canal was beautiful, and the weather could not have been more perfect. 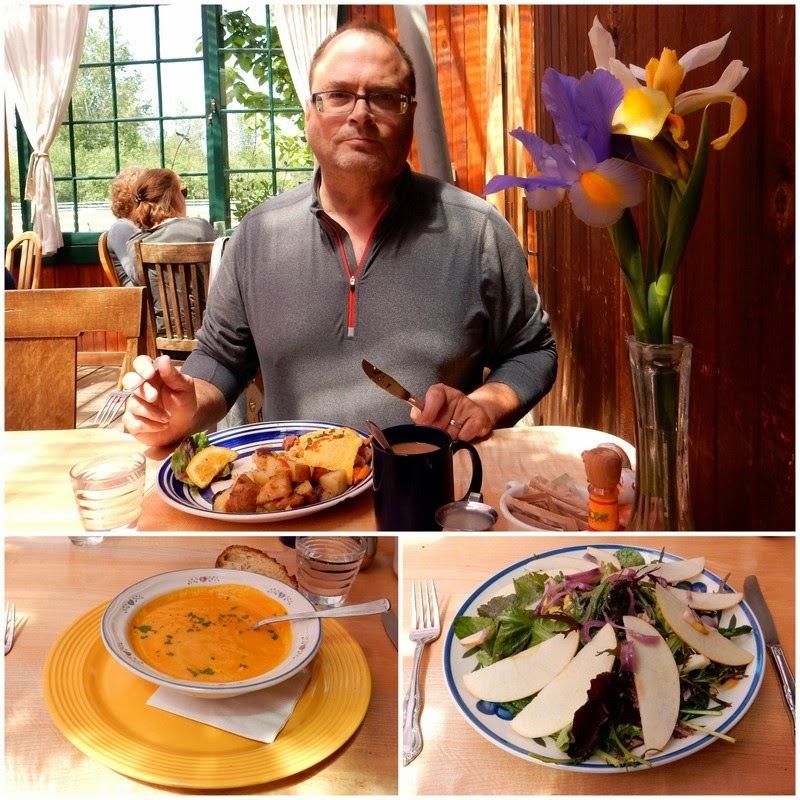 We had debated spending the night in Port Townsend, a town that we had fallen in love with on our nine-month trip, but instead headed directly to the ferry for the crossing to Whidbey Island. What a great day to be on the water. We arrived on Whidbey Island in the late afternoon and settled into Rhododendron Park, a small, county campground in the middle of the woods. We were the only ones there, and it was so peaceful. I enjoyed watching the few rays of sun that found their way through the tall evergreens and created lovely patterns on the forest floor. We left the next morning and crossed back to the mainland, and we seemed to find more errands that needed to be done before entering Canada. Although we were so close to the border, we checked into a campground in Lynden and decided to stay for two nights so we’d have one entire day to chill. Although the last week had been fun, we needed a break. It is now Friday, May 8, and I am finding it hard to believe that I am actually writing this blog post in real time. It’s taken me forever, but I have finally brought the blog up-to-date. We will be crossing into Canada tomorrow and will have to search for Wi-Fi since we will only have a minuscule data allowance on our global plan – not enough to post updates to the blog. I’m afraid we may go into internet withdrawal! 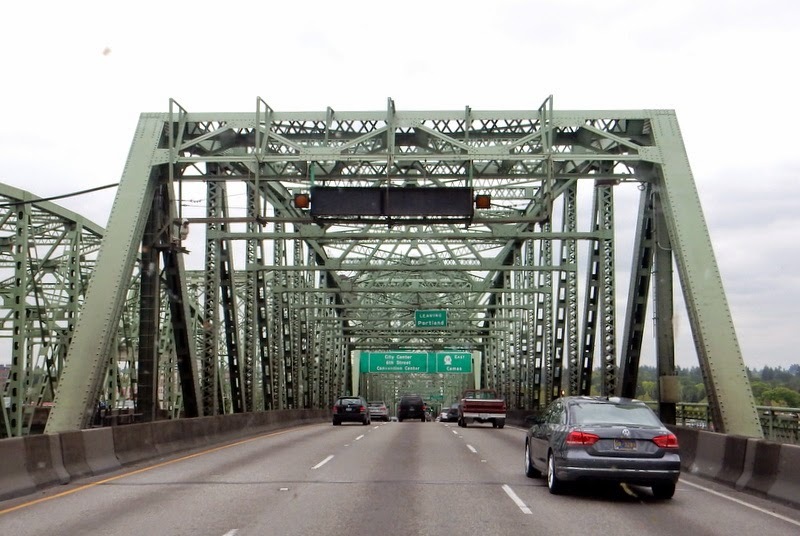 We will spend the better part of a week driving from the border at Sumas, Washington, to Prince Rupert, British Columbia, where we will catch the ferry to Alaska very early on the morning of May 16. Our first stop in the Inside Passage will be Ketchikan, where we will spend three nights. We already have one adventure booked, and I can’t wait. From there, we will catch another ferry for Wrangell on May 20, and then another for Petersburg on May 23. We’ll sail to Juneau on May 27, and finally to Sitka on May 31. We’ll be in Sitka for two weeks, and Tim and I will be working at Sitka National Historical Park. It’s a project we’re looking forward to. I can’t wait to tell you all about it. I’ll try to post updates to the blog two or three times a week, but given my history, I can’t promise anything! I will! He asked about you and how you were doing. It was great seeing you guys and also reading your post and knowing exactly where you were like I was there with you. Pa. Thank you for driving down to see us. It was great to finally meet you. I hope you will be able to travel vicariously with us to Alaska.